In order to cut off debate, believers of the global warming hypothesis disparage those who are skeptical of it by comparing them to people who say the Holocaust never happened, calling them "deniers." Some, like Secretary of State Kerry, say skeptics are like members of the "flat earth society." But, a study by Yale Professor Dan Kahan to be published in Advances in Political Psychology reports that skeptics score slightly better in a quiz about climate science than believers. As reported by FoxNews.com 2,000 respondents were asked "nine questions about where they thought scientists stand on climate science." Antarctic ice should not be a problem, at least in the near term. A study released in January 2015 reported that the South Pole's sea ice extent has been growing since 1979, while other research says Antarctic temperatures haven't increased during the same period. The believers who answered the above correctly are refusing to acknowledge that, 12,750 years ago, the Earth's average temperature was about the same as it is today - but, the amount of CO2 in the atmosphere at the time was higher than current levels. They are also ignoring the fact that, during some of the Earth's ice ages, the CO2 levels were 5-10x higher than today. A similar study conducted in 2012 and published in the journal Nature Climate Change found that global warming skeptics know just as much about science; but the study detailed above questioned respondents specifically about climate science. Climatologists who are skeptical about the extent of man-made global warming say the results don’t surprise them. “It's easy to believe in the religion of global warming. It takes critical thinking skills to question it,” Roy Spencer, a climatologist at the University of Alabama in Huntsville, told FoxNews.com. I accept that climate change is a process which has been ongoing since beginning of detectable history, but there seems to be a definite correlation between the recent increase in world-wide temperatures and man’s entry into the industrial age,” he said. “If it’s a coincidence, it’s quite a remarkable one. We may have experienced a temperature increase even without our use of fossil fuels since the Industrial Revolution, but I doubt it would be as dramatic as what we’re seeing now. Thanks to the latest study by Professor Dan Kahan, we now know that along with having the same beliefs as the leader of the "flat-Earthers," proponents of the global warming hypothesis are not as knowledgeable about climate science than those who are skeptical about climate change. IMPORTANT PROGRAMMING NOTE: For those who planned to attend the Yale University Global Divestment Day sponsored by Fossil Free Yale, the event has been canceled. 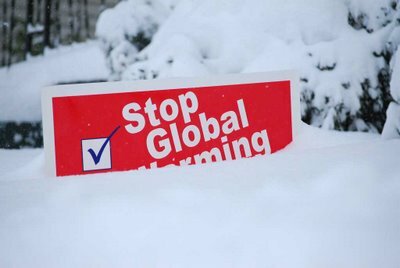 Per the Daily Caller the "frigid, snowy weather set for this weekend will mean their global warming protest will have to be postponed."